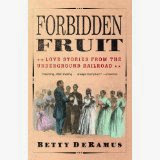 Forbidden Fruit is a collection of fascinating, largely untold tales of ordinary men and women who faced mobs, bloodhounds, bounty hunters, and bullets to be together -- and defy a system that categorized blacks not only as servants, but as property. Here you'll meet, among other extraordinary characters, a fugitive slave from Virginia who spends seventeen years searching for his wife. A Georgia slave couple that sails for England with federal troops trailing behind. A white woman who falls in love with her deceased husband's slave. A young slave girl who is delivered to her fiancé inside a wooden chest. Acclaimed journalist Betty DeRamus gleaned these anecdotes from descendants of runaway slave couples, unpublished memoirs, Civil War records, census data, magazines, and dozens of previously untapped sources. This is a book about people pursuing love and achievement in a time of hate and severely limited opportunities. Though not all of the stories in Forbidden Fruit end in triumph, they all celebrate hope, passion, courage, and triumph of the human spirit.